Single Ventricle refers to the congenital heart defects in which the heart functionally has only one pumping chamber. Examples are Tricuspid Atresia, Hypoplastic Left Heart Syndrome, Double Inlet Left Ventricle, and Double Outlet Right Ventricle. Other defects (e.g. 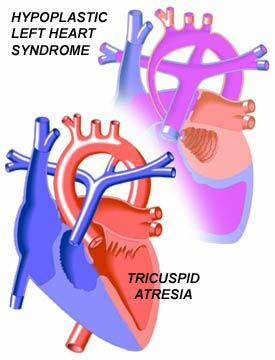 some forms of Atrioventricular Canal Defect and Pulmonary Atresia) may create single ventricle conditions in the heart. Adult patients with these defects will usually have had a Fontan Operation. In cases where early treatment consisted of a Glenn procedure and/or the insertion of a shunt between the systemic circulation and the pulmonary artery (e. g. modified or classic Blalock-Taussig Shunt), the patients may be candidates for the Fontan in later life. Very rarely, a person with Single Ventricle reaches adulthood without treatment and without symptoms. These patients may or may not receive the Fontan, depending on an assessment of the relative risks and benefits. · the systemic ventricle is functioning adequately. These criteria will be evaluated through a variety of tests. A chest x-ray, echocardiogram, and MRI (Magnetic Resonance Imaging) will show left ventricular function and other aspects of anatomy and cardiovascular condition. Electrocardiogram (ECG) is used to check for the presence of arrhythmias (irregular heartbeats) and as an indicator of certain anatomical defects. In addition, a cardiac catheterization procedure will be used to take hemodynamic measurements (blood pressures and concentrations of oxygen and other gases) in the pulmonary arteries and to evaluate their structure. In some cases where a Fontan operation is possible, the atrioventricular valve will need to be repaired or replaced. The prognosis after this operation for single ventricle patients is better than for other treatments, and improvements of surgical technique continue to be made. If there is unequal blood flow to each lung from the inferior vena cava portion of the Fontan, intra-pulmonary arteriovenous malformations may form in the affected lung and present with symptoms of decreasing oxygen saturations (cyanosis). It is also becoming apparent that adults with a Fontan repair are at risk for cirrhosis of the liver for long term exposure to increased central venous pressure and should be monitored closely for development.